Set the perfect stage for any event with the Gala Resin Series chair. 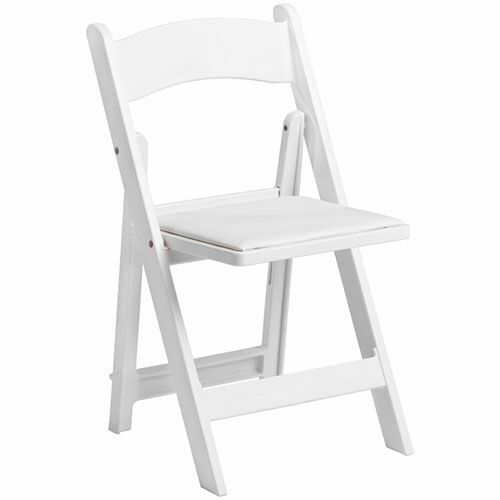 Light weight but heavy duty, this chair makes setup fast and easy, without sacrificing quality and comfort. These chairs are built to last, weatherproof and UV protected. Heavy duty - Supports up to 1000 lbs. The Gala Series Chair is made from 100% polypropylene resin. This virgin material is UV stabilized for weatherproofing and to prevent fading. The zinc-coated screws used in construction prevent rust and go all the way through the legs for better support. Two seat bars carry the seat load, not the screws. The padded, upholstered foam seat snaps in and out easily with sturdy clips made into the seat. Interlocking features allow for better stacking, allowing up to 30 chairs to be stacked on a dolly. Load tested by SGS Laboratories to over 1000 lbs.